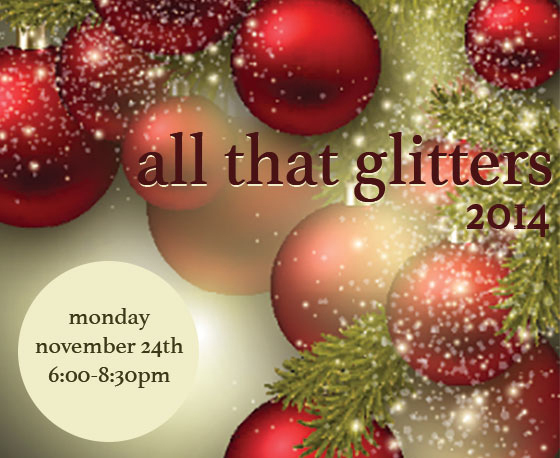 You’re invited to All That Glitters 2014 – our annual beauty & wellness event designed to bestow a warm seasonal glow and kick-start your holiday shopping. Join us for a festive evening of fun & informative workshops, beauty-boosting makeovers & products, great gift ideas and amazing prizes! Get Sultry & Smoky with National Makeup Artist Ruben Potrebenko, as he presents the newest Holiday Collection from Jane Iredale…indulge in a Mini Makeover with one of our Raintree Beauty Experts… Boost Your Wellness with Raintree Massage Practitioner Shannon Abbott. Stroll through a winter wonderland of sparkling gift ideas…Sample an array of products…Nibble goodies and sip raintree champagne teas…Enjoy amazing gifts with purchase and special savings on spa products…Win fantastic prizes, including a Raintree Makeover, Holiday Harmony Body Wrap, Jane Iredale skin care, Raintree Naturals body care and and much more!! !